With Power BI mobile apps on iPhone and iPad, you can view and interact with all of your pre-defined reports and dashboards while on the go. But what about answering questions that are not pinned to your dashboards? Or questions that you didn’t prepare for? With this release, we are happy to add a preview of Q&A capabilities to our Power BI iOS app. With a unique chat-like experience that's tailor-made for natural language, you can ask questions of your data and receive answers in the form of charts and graphs directly on your mobile device. Try it out today on our samples or learn how to optimize your own data to work seamlessly with Q&A! We are eager to hear your feedback! Join the discussion in the Q&A Discussion on Power BI community. Why should I use Q&A on my phone? Many users monitor their business remotely by looking at metrics such as YTD Sales or Monthly revenue on their mobile devices. These metrics are usually well established in the organization and represented in official reports and dashboards. With Q&A, we aim to serve the unexpected scenarios. Imagine being in a monthly performance review meeting and wanting to answer questions about last year, while your dashboards show only the current year. With Mobile Q&A you can literally have a conversation with your data. Type any question in the chat, or use iOS native speech recognition to dictate your question to your phone. In your workspace on the Power BI service (https://powerbi.com), select Get Data > Samples > Retail Analysis Sample > Connect. Or click this to add this sample to your workspace. Choose show from the keywords and then pick sales from the suggestion list > Send . Choose by from the keywords and then pick item from the suggestion list > Send . Choose as from the keywords, type col and then pick the icon of the column chart from the suggestion list > Send . Long tap on the result and choose Expand. Go back to the Q&A chat and type new q or new to clear the text box and start over > Send . Try a new question by choosing top from the keywords then pick sale by avg $/unit ly > Send . Choose by from the keywords and then pick time from the suggestion list > Send . Type as and pick the line chart icon from the suggestion list > Send . Need help? Just type Hi or Help, and you'll get assistance with starting a new question. Q&A can search structured data and choose the right visual for your question — that's what makes it a compelling tool to use. Q&A can work on any dashboard available on the Power BI service*, but the more optimizations and data cleaning you do, the more robust Q&A's performance will be. If you wish to use Q&A to query your own data, please make sure you read our guide on making your data work well with Q&A. * Note: Q&A doesn’t work on Cloud models with row-level security (RLS) or direct queries. Q&A on iOS was designed for mobile from the ground up, including touch interactions, a special visualization menu, and tooltips. To get the best possible results for your question, you may want to use Q&A keywords. Learn more on how to talk to Q&A to get the best possible results. 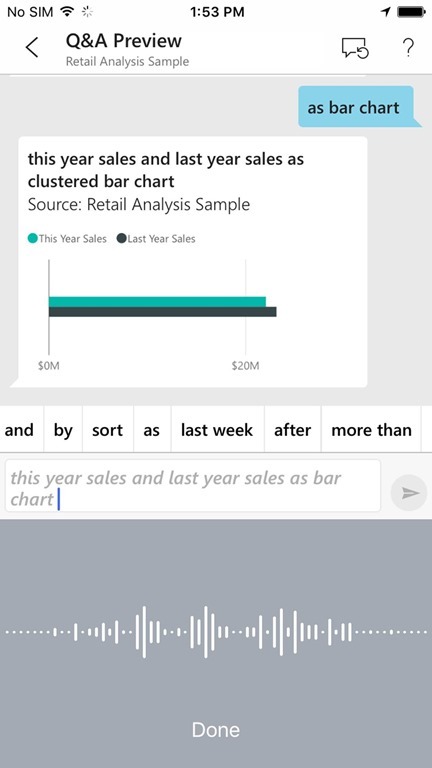 The Power BI app supports voice input, you can use the microphone in your native iOS keyboard to dictate your question and get an answer immediately. With Q&A on Power BI Mobile, asking the question is just the beginning! Have fun traveling through your data refining or expanding your question, uncovering trustworthy new information, zeroing in on details, and zooming out for a broader view. Have any feedback? Join the discussion in the Q&A Discussion on Power BI community.